If you’re a blogger and aren’t earning money through affiliate marketing, there’s a good chance that you’re not earning at your full potential as a blogger. An affiliate program is a marketing program that allows you (the affiliate) to receive a commission for promoting a merchant’s products. Affiliate marketing is an excellent way to earn money through your blog. When I began blogging, I ignored affiliate marketing because I thought it would be a waste of time. Once I began diving into the world of affiliate marketing, I realized that for years I had been promoting products without earning a cent. Not to say that there’s anything wrong with that, however, if you can promote your favorite products and earn money in the process, then why not, right? I increased my affiliate income by over 3,150% after taking theMaking Sense of Affiliate Marketing course. Click here to learn more. 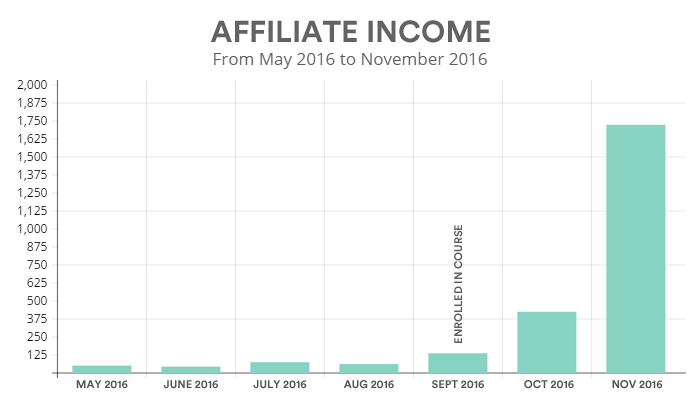 If you’re interested in earning affiliate income, here are six affiliate programs to get you started. Update: Whenever I come across a new affiliate program for bloggers, I’ll be updating this post with more options. ShareASale offers pay-per-sale, pay-per-lead, and pay-per-click programs, with a minimum payout of $50. ShareASale is my favorite affiliate program because of their large marketplace (they have tons of blogger friendly programs) and the ease of use. If you want to make money through affiliate marketing, I highly recommend you give ShareASale a try. Ebates offers cash back at over 2,000 stores whenever you begin your shopping through the Ebates website. I love the Ebates affiliate program because not only can you earn cash back for purchases you make, but as a blogger, you will receive $5 for every referral as well as some pretty nice bonuses. The Ebates affiliate program pays out quarterly with a $5.01 minimum. Sign up here to join Ebates. CJ Affiliate is one of the largest affiliate programs around. If you can think of a company, there’s a good chance you’ll find their affiliate program on CJ Affiliate. I’ve been using CJ Affiliate for almost a year, and while it is one of my favorite affiliate programs, it’s not as user-friendly as ShareASale. I definitely had to take some time to familiarize myself with their platform. With CJ Affiliate, you can choose your minimum payout, with $50 being the absolute minimum. Amazon is a hugely popular affiliate program for both new and seasoned bloggers. Amazon affiliates is easy to join and use, allows you to choose from over one million products to advertise and will give you up to 10% commission on qualifying purchases. While the commission is pretty small, the thing I like about the Amazon affiliate program is that if someone visits a product through your affiliate link and decides not to buy, BUT ends up purchasing something else instead, you can still earn a commission on the product they purchased. Pretty cool, right? Creative Market is an online marketplace community that allows you to buy digital design products such as WordPress themes, vector graphics, photography, fonts, and more. Creative Market offers a 10% referral commission for every new customer you bring to their site. Now again, I think 10% is a pretty low commission, however, with this affiliate program, you will earn 10% on every purchase that customer makes for an entire year. Now for me, that makes the Creative Market affiliate program worth joining. Of course, I had to add my affiliate program to this list. As aBeautiful Dawn Designs affiliate, you’ll earn a 30% commission for every customer that you refer to our shop. Our cookies are good for 60 days, and there is no minimum required for payout. Rakuten Marketing (formally known as LinkShare) has been voted as the number 1 affiliate marketing network. Rakuten Marketing has thousands of programs to choose from (such as Macy’s, Sephora, and Walmart). Click here to access the affiliate registration form. VigLink is a very interesting and unique affiliate marketing network. VigLink works by converting your existing outgoing links into affiliate links. This means you don’t have to sign up for individual affiliate programs. For example, if you write about a book you just read and provide a link to the book, VigLink will turn that link into an affiliate link. Now, whenever someone makes a purchase through that link, you’ll earn a commission.